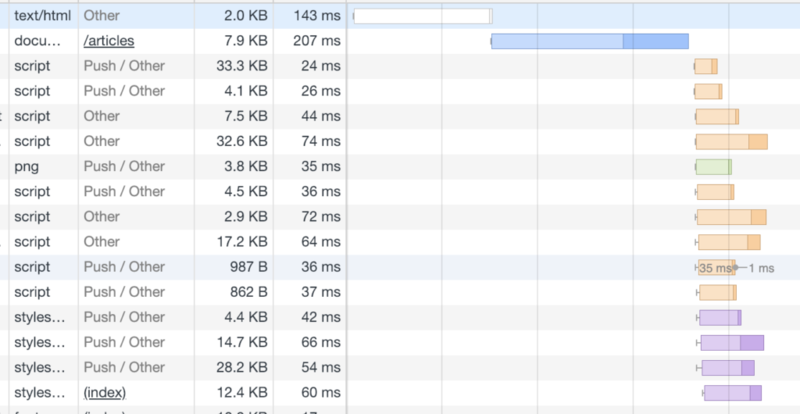 Taking advantage of HTTP/2 push can bring big improvements to front end performance. This pushes resources to the browser preemptively, avoiding extra requests and waiting time. I’m going to cover how to do this in WordPress. This has made big improvements to page load times, removing connections and waiting times for resources, as well as doing transfers in parallel. To start with, I did this manually in functions.php, and it helped in particular with Google Analytics and Typekit. To get Nginx actively pushing data to the browser, I added the http2_push_preload on; directive to my sites config, and reloaded Nginx. This pushes any resources with relative URLs in the http header taking the Link: </...>; rel=preload format mentioned above. It only works for relative URLs on the same domain though, falling back to the previous behavior for Typekit and other external resources. Files transferred with a * were sent via HTTP/2 push. It acts at the last moment of the template_redirect action, but this means only a subset of scripts and styles are caught. Sadly, it’s not possible to do this with the print styles actions. In the future I might experiment with output buffering to delay the first byte long enough to run on this script. Pushing inline scripts would also need full page output buffering. This would kill performance though in the same way that Autoptimize destroys time to first byte.